I thought I would put some info out there for anyone interested in building a decent clock for the 03'-04' G35. It has been the one thing in the dash that really bothers me and seems to be a waste of space for just hours and minutes. So I'm replacing Big Ben for a digital RTC clock. It will keep time if the battery is disconnected and will add seconds, date, time and temp if I want. It is based on the Arduino Nano micro controller and a 2.8" TFT screen. 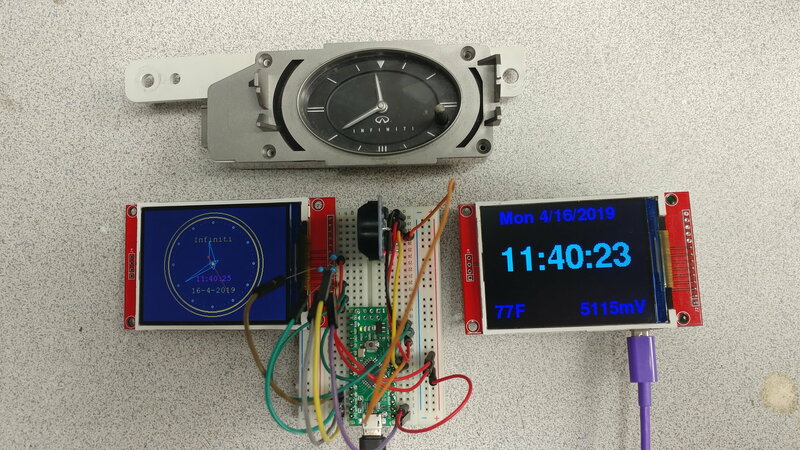 I am still playing with the code and have to get it mounted in the original clock pod to see how much display / screen space I will be able to use with the trim in place. The cost of parts was about $20 and I'll add more info as I go along with the project. Pinout, code, and part information will be added soon. I used Arduino IDE version 1.8.8 for this project. Other versions will probably work too. 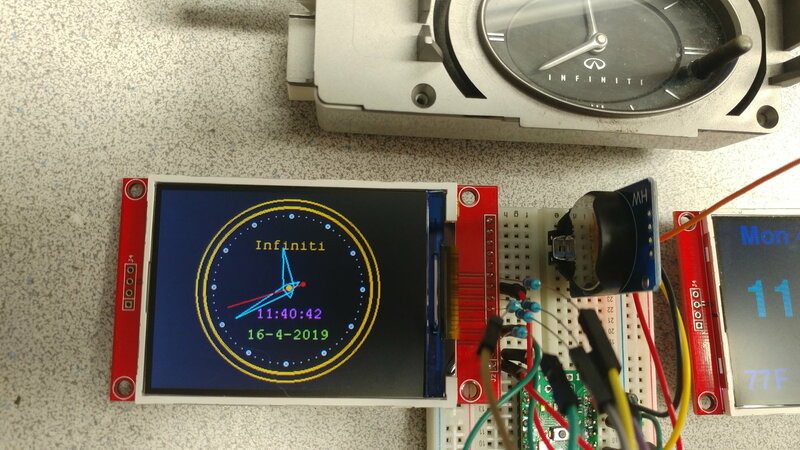 Clock 2.5 is written by Cee'z his build uses a mini pro and 1307 clock.. Link to his page: Cee'z Arduino Clock - I have modified it for the Nano, DS3231 clock, and 2.8" TFT. I also added "Infiniti" to the face. 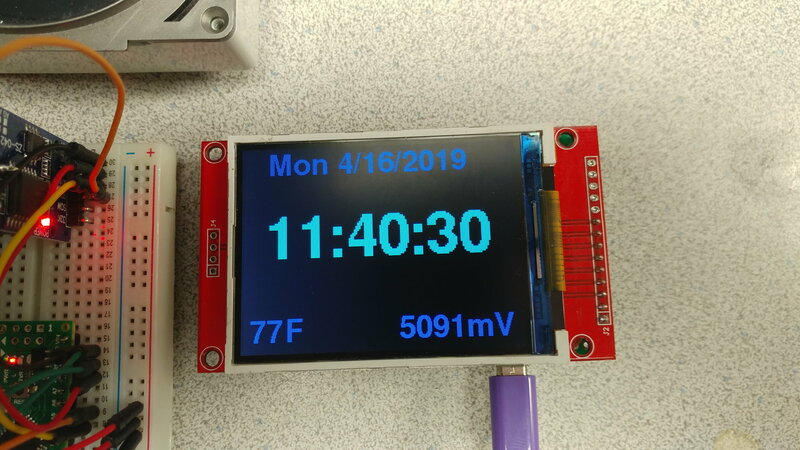 Simpleclock is written by Slider2732 and also uses the mini pro, 3231 clock, 2.2 TFT. 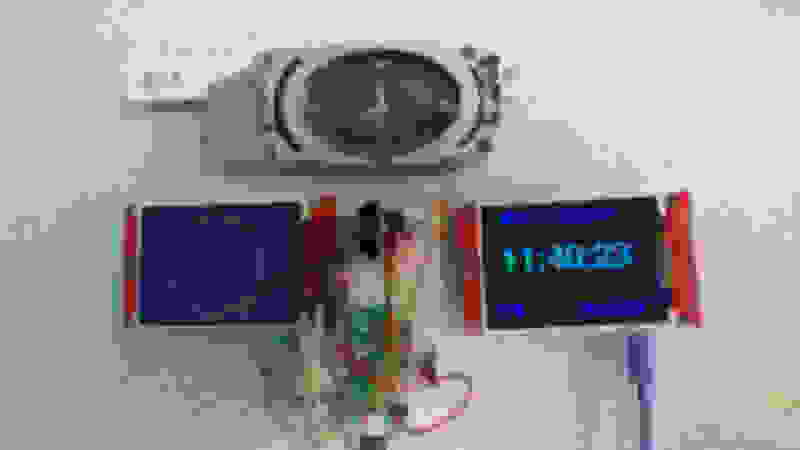 - I have modified it for the Nano, DS3231 clock, and 2.8" TFT. Last edited by scumbagsleeper; 04-18-2019 at 01:08 PM. If you're going to do this it needs to be in ORANGE! Personally I love the analog-looking clock in mine, but it's an '06 and the clock looks better sandwiched between the compass and outside temp. I agree, my 05' isn't too bad. I thought about color matching the clock to amber/orange dash scheme, mostly because I don't feel like converting five thousand LED's in the dash. The cool thing about it being Arduino based is you can program it in 30 seconds to anything you want. It doesn't even have to be a clock. Also the 05' - 06' clock doesn't have as much room between the HVAC LCD's so I would have to use a different TFT panel. Following. I was just thinking about doing something like this because my clock has bad leds and I am bothered by the wasted and prominent real-estate of an analog clock - and don't want to spend for a jdm digital just because jdm. Added a bunch of stuff to the top if anyone wants to play. I still have to get the clock mounted in the stock clock cup and remove the power connector from the old clock board so it's Plug'n'play. I'm going to leave a USB hanging somewhere so I can reprogram it with different stuff as I go, It could be awhile before I get to any custom clock code with my 05' soaking up every extra hour I have to work on anything. I thought it might be cool for the clock to flash informational text during certain events like when it goes into boost or WOT could say "Engage Ludacris speed" or Warning Danger to Manifold" or just some funny crap to add to it. What's the part number for the Analog clock chip? 2003 g35c Bose (Blowes) amp Bypass?